Ph.D. in Paramedical Sciences is a 3-year full-time doctorate course. Minimum eligibility for which is 55% of marks or 6 GPA point scale in Master’s degree or an equivalent degree from a recognized university. 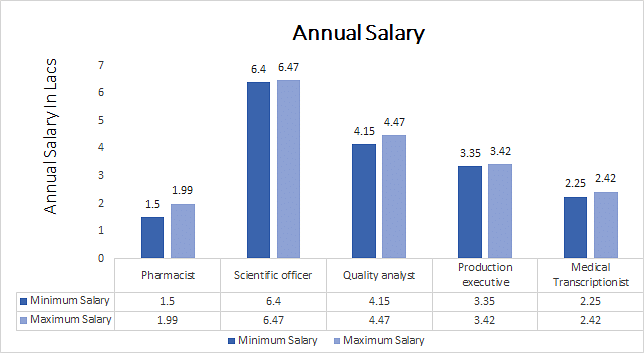 The average fee for this course ranges between INR 10,000 to INR 15 Lacs based on the candidate’s marks obtained in their master’s degree or entrance exams. This course takes a global look at practices within the paramedical industry and their impact on health care and research. This course develops extensive research skills and makes candidates expertise in this paramedical field. In this course, students will explore the intellectual properties and reviews in the drug allocation. Admission to Ph.D. in Paramedical Sciences is based on merit list or entrance-based. Most of the colleges select students based on the marks obtained in their master’s degree or Master’s degree for Ph.D. in Paramedical Sciences Admissions. Some reputed colleges conduct entrance exams for this course admission. Students who are selected for entrance exam should attend the personal interview conducted by the college. Based on their performances, they will be selected for admissions. After completion of this course, graduates may work in fields like Hospitals and Clinics, State wise Drugs and Pharmaceutical Boards, Medical Shop chains, etc. These professionals may work in positions like Pharmacist, Scientific officer, Quality analyst, production executive, Medical Transcriptionist, etc. The average salary for these professionals ranges between INR 2 to 20 Lacs as per their experience and expertise in this field. Ph.D. in Paramedical Sciences: What is it about? Ph.D. in Paramedical Sciences deals with the formulation of a pure drug substance into a dosage form. This course is the study of drugs, and this involves drug development. There are some elements of biomedical analysis, pharmacology, pharmacokinetics, and pharmacodynamics. This includes drug delivery, discovery, metabolism, absorption, and more. Students in this course learn the chemical structures, behavior, and properties of different pharmaceuticals. In this course, students survey the various regulations and rules enacted to prevent abuse fraud and waste in the pharmaceutical industry, some, particularly within the Medicare and Medicaid programs. In this course, students learn to analyze and interpret statistical data related to the development and government approval of drugs biologics and medical devices. Candidates who have completed Master’s degree or an equivalent degree from a recognized university are eligible for Ph.D. in Paramedical Sciences course. Candidates who have 55% of marks or 6 GPA point scale in Master’s degree or an equivalent degree are also eligible. The percentage may vary from one college to another. Eligible candidates may apply for this course through online or offline. Candidates can fill an application form and apply for this course on the official website of the respective colleges and institutes. Candidates can get an application form directly from the admission office of the respective colleges. A semester-wise syllabus for Ph.D. Paramedical Sciences is given below. The syllabus may vary from one college to other. Ph.D. in Paramedical Sciences: Who should opt for this course? Candidates who have interest in Paramedical Sciences and its related applications are suitable for this course. Candidates who have communication and interpersonal skills are suitable for this course. Candidates who have the ability to analyze a situation, managing conflict, negotiating goals and plans, advocacy, and problem-solving skills are suitable for this course. Paramedical sciences field has lots of job opportunities in India. Graduates in this field may work in areas like hospitals, pharmaceutical laboratories, nursing homes, public health facilities, clinics, colleges, universities, etc. These graduates may also conduct research supervised by medical researchers. These professionals are responsible for conducting complex tasks, maintaining report accuracy, training, and testing under stipulated conditions. Professionals may work in job roles offered by the top hospitals, laboratories, and organizations are lab technician, blood bank technician, medical technician, analytical chemistry associate, medical lab in-charge, medical technologist, lab technician trainee, drug safety associate, medical officer, development manager, lab assistant, technical officer, scientist, research manager, blood transfusion assistant, etc.